Everybody&apos;s treading water these days, but marine businesses in what is often dubbed the Rust Belt (much to the chagrin of some locals) have been struggling with anemic sales since the turn of the millennium. It is difficult to make sweeping generalizations about a region as large as the sprawling Midwest, though some comparisons certainly can be drawn around those areas that traditionally have relied on manufacturing. "Even in the Rust Belt, there are different economies that are going to be influencing sales," says Aarn Rosen, a marine analyst with Grand Rapids, Mich.-based Statistical Surveys Inc. "But overall, certainly we can see the market has been contracting." The data show boat sales began slipping around 2000. There was a small spike around 2005, but when auto and parts manufacturers in Michigan began laying people off, unemployment numbers began to soar, and, consequently, boat sales plummeted once again. Manufacturing jobs shrank by nearly 20 percent in the Detroit area last year alone, causing unemployment to balloon to 11.7 percent of the work force in December 2008, U.S. census data show. Detroit-Warren-Livonia, Mich., reported the highest unemployment rate in February at 13.6 percent, according to the U.S. Department of Labor. Boat sales for nine counties around Detroit were cut by nearly half in less than a decade. Close to 6,500 units between 18 and 29 feet were sold in 1999. In 2008, that number was down to around 3,500, according to Statistical Surveys. Van Snider, president of Michigan Boating Industries Association, worries about the survival of both dealers and manufacturers. "This has been a very long downturn and, if the economy doesn&apos;t improve soon, I think we will lose some firms," Snider wrote in an e-mail. Though MBIA doesn&apos;t track dealership failures, Snider says he&apos;s surprised he hasn&apos;t seen more fold. But, he notes, "The longer this economy takes to recover, the more likely we will see companies calling it quits." Michigan&apos;s overall unemployment rate is the nation&apos;s highest at 12 percent (up from 10.6 percent in December), compared to the national average of 8.5 percent. 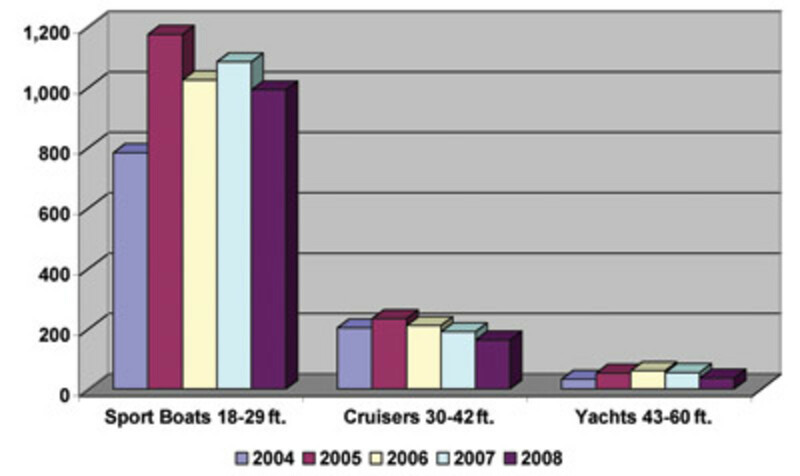 Not surprisingly, sales of fiberglass boats between 14 and 30 feet dropped more than 40 percent year-to-year in Michigan - from 57 units sold in January 2008 to 34 units in January 2009. "Their market shrank when the automotive industry contracted," says Rosen. The impact of the auto industry malaise stretches beyond Michigan. From Chicago, to Gary, Ind., to Cleveland, the loss of manufacturing jobs has inflicted economic pressure for years. Business is half in 2009 what it was in 2000, says Cleveland-based Parma Marine owner Hart Morrison. "Every year it deteriorates a little bit," Morrison says. Figures from Statistical Surveys show that nine counties in the Cleveland-Akron area began declining around 2001. In 2000, almost 1,300 fiberglass sportboats between 18 feet and 29 feet were sold. In 2001, that number dropped to fewer than 1,000, and in 2004 it was down to fewer than 800. While the area rebounded briefly in 2005, in 2008 fewer than 1,000 boats in that category were sold - an improvement over 2004, but still far below the 1999 and 2000 totals (see Cleveland area chart). Despite the downturn&apos;s longevity - or maybe because of it - dealers in this region seem optimistic that boaters itching to get back on the water will return. They talk about the new administration in Washington and lower gasoline prices. "I think you&apos;re going to see an upturn in the market, and I think there&apos;s a pent-up demand," says Gary Kohout, sales manager at Gregory Boat Co., a Detroit brokerage. "People still want their recreation." Even with the highest unemployment rate in the nation, Pete Beauregard Jr. says staff at Colony Marine Sales & Service in St. Clair Shores, Mich., concentrates on the 90 percent still working. "We may have been the first in, and maybe we&apos;ll be the first out," says Beauregard. "That&apos;s kind of what we&apos;re hoping for." The economic erosion in the Great Lakes region goes beyond the spike in auto industry layoffs four years ago. At the time those layoffs were occurring, low-water levels were making boating difficult or impossible in some places, Beauregard says. Then, last year&apos;s record-high fuel prices crippled the industry again. "This year, it&apos;s just an overall shrinking of the economy," Beauregard says. "Now that we&apos;ve seen an improvement in fuel prices, certainly that helped us in this year&apos;s boat shows. The water levels in the Great Lakes are up, so that&apos;s been a plus as well. And, we&apos;re seeing a little bit of loosening in the [retail] credit market ... So, it gives us some reason to be optimistic." What exactly is the Rust Belt? "It was the nation&apos;s primary steel-producing region, but now most of the steel industry has disappeared and many former plants are rusting away; thus the name," says Norm Schultz, former president of the Lake Erie Marine Trade Association. Its center is generally considered Cleveland, he says, and it primarily included Ohio, Michigan, northern Indiana near Gary and Hammond, northern Pennsylvania around Erie, and the once bustling iron ore ranges in Minnesota. "Put another way, the primary Rust Belt is located along the shores of Lake Erie, Lake Michigan and Lake Superior," Schultz says. "Some include the coal mining areas of southern Ohio and Pennsylvania ... since steel making used lots of coal." While the graphs look somewhat similar, there are differences. In the Chicago area, fiberglass boats between 18 and 29 feet bottomed out for the decade in 2004, dropping to about 3,500 units from about 4,500 units in 1999. Only the Chicago region had more sales in the mid-2000s than in 1999, with more than 5,000 units sold in 2006. In 2008, sales dipped below 4,000. Because of these market nuances, it&apos;s important for retailers to watch their own turf and not to make decisions based on national trends, Rosen cautions. Larsen&apos;s Marine in Waukegan, Ill., stopped selling powerboats last year after 40 years because of slow sales. Instead, the 75-year-old dealership is concentrating on sailboats. That decision was partly driven by high fuel prices that not only hit consumers at the pump but drove up the price of fiberglass, says marketing manager Brian Larsen. "The sailboat business is still a little bit insulated from fuel prices, since the wind is still free," says Larsen. He is one of five third-generation Larsens at the dealership in Lake County, about halfway between Chicago and Milwaukee. Larsen says 2001 was the last strong year in terms of new-boat sales. Declines accelerated after 2003, but Larsen relies more on service and storage than sales, and has grown the storage business by about 10 percent. Larsen would not lump greater Chicago in with places like Detroit or Cleveland, since Chicago relies more on commodities, trading and banking than manufacturing. "We all share some issues ... but they have more serious issues with the auto industry and steel industry," Larsen says. "The banking and brokerage industries are very strong in Chicago, though obviously there are issues with those industries too." Russ Terpstra, second-generation owner of Terpstra&apos;s Blue Water Marine in Griffith, Ind., has noticed the lending squeeze on both the wholesale and retail sides. The dwindling number of wholesale lenders has caused several dealers he knows to struggle, and retail loans are only being made to "gold-plated" buyers, he says. While lending is tight everywhere, Schultz believes it&apos;s harder for buyers in the Midwest to find a loan. "I&apos;m sensing that banks may be discriminating against the boating industry in the Rust Belt," Schultz says. "We know banks are using some criteria they won&apos;t talk about to unilaterally cut consumer&apos;s credit card limits [and] raise minimum payments or fees based on where the card-holder lives or works or shops - talk about profiling," Schultz says. "I sense the banks are doing the same to Rust Belt boaters when it comes to disapproving good loan applications." The rest of the nation is finding out what business owners in this area discovered four or five years ago, Beauregard says. "But ours was probably less of a drop off the end of a cliff," he says. "Because we&apos;ve been in somewhat of a decline for the last four or five years, it probably has helped us manage inventory a little better." Business at Colony Marine is down about 30 percent from five years ago, Beauregard says. That number would likely be higher if his dealership wasn&apos;t so close to Canada, where buyers looking to maximize a strong Canadian dollar buoyed used-boat sales. In Indiana, Terpstra hasn&apos;t been as lucky. In the past few years, business at the dealership near Gary has dropped about 60 percent. The unemployment rate in Gary rose sharply between November and December 2008 - from 6.9 percent to 8.3 percent, according to U.S. Census data. Gary is only about 30 miles from Chicago, and its boat sales figures are incorporated into the greater Chicago data by Statistical Surveys. However, Chicago&apos;s unemployment rate was 7.1 percent in December, slightly below the national average. "We&apos;ve just kind of watched [business] steadily decline," says Terpstra. "We make fewer and fewer sales, and [they &apos;re] getting tougher to make. Really, the only thing you could do was continue to drop your price until the consumer felt good enough to purchase." Listings at Detroit&apos;s Gregory Boat Co. have increased about 30 percent in the last year, says sales manager Kohout. "Obviously, sales have been down; there&apos;s no question there," he says. "They are not what they were even a year ago, but we&apos;re still selling boats - mostly at reduced prices." Clients are reducing asking prices drastically to sell their boats, and with more vessels on the market than ever before, Kohout is turning some away. "If they&apos;re not realistic in their price, there&apos;s no sense in putting them on the market right now," he says. "We are still continuing to have job losses in the area, and we were hurt last year with the high fuel prices." Kohout hopes lower gas prices will encourage boaters to take trips they had put off in the past couple of years. Michigan has long held the reputation of having a boating culture that extends to the middle-class, and despite the economy, Kohout doesn&apos;t think that has changed. "Some people are just getting out of boating, but we still have clients that want to move up in size, too," Kohout says. Morrison has owned Parma Marine for six years, and has worked at the 54-year-old dealership since 1978. In the three decades he&apos;s been there, he has counted 26 dealerships that have come and gone in a 35-mile radius that covers Cleveland and Akron, Ohio. "That has mostly been over the last decade," Morrison says. "Ever since I started working here, one or two went under each year. Some guys just sold out and left, so obviously there just isn&apos;t that much of a market." Layoffs have been a regular occurrence since 1996 at a General Motors plant in Parma, Ohio, and some worry the plant will be closed for good. There are three Ford plants in the Cleveland area that also have experienced cutbacks, with one idling and another deferring production in 2007. The unemployment rates in Cleveland, Elyria and Mentor, Ohio, rose from 6.6 percent in November 2008 to 7.1 percent in December. In late February, however, Ford announced that the idled plant in suburban Cleveland will begin making a new line of fuel-efficient engines. It will take more than the addition of 250 jobs to revitalize the area, but still, it was better than losing 250 jobs, Morrison says. "I think there are GM workers and Ford workers who are worried about their pensions - and they&apos;re our customers," Morrison says. "Most people buying are of retirement age. The only good thing is fishermen; they not only want to fish, they need to. It&apos;s a passion." That will help Parma sell his Alumacraft and Campion boats and accessories, especially because a Boater&apos;s World (one of the entire 130-store Boater&apos;s World Discount Marine Center chain now going out of business as a result of bankruptcy) had recently closed, Morrison says. "I have no competition," he says. "Most of the competition is gone, other than backyard mechanics. I believe in our county here, right around Cleveland, there are only two boat dealers left and a [personal watercraft] dealer. That&apos;s it." Population counts are down as workers leave some areas of the Midwest in search of jobs. In Detroit, the population dropped 8.4 percent, reflecting the loss of more than 80,000 people between 2000 and 2006, the most recent year for which the U.S. Census Bureau has data. In Cleveland, the population dipped 6.9 percent during that period, losing more than 34,000 people. Additionally, America&apos;s four most impoverished cities in 2007 were in the Midwest/Great Lakes region. Detroit ranked first, with 33.8 percent living below the poverty line. Second was Buffalo, N.Y., with 29.9 percent of the population living in poverty. Ohio had the dubious distinction of having two major cities on the most impoverished list. Cincinnati ranked third with 27.8 percent and Cleveland fourth at 27 percent. Despite the grim figures, dealers have survived by supplementing sales with service, storage and adjusting inventory. Service has only been off 10 percent at Gregory Marine. That revenue helps, as well as the 600 boats that fill heated, indoor cold and outdoor storage facilities, Kohout says. Colony Marine also has supplemented lagging sales with storage and service, Beauregard says, and Larsen&apos;s Marine has expanded storage and continues to operate at almost 100 percent capacity. Terpstra Marine adjusted inventory right away. Instead of ordering 10 or 12 parts or accessories, Terpstra only stocked two or three. The dealership also cut back on dating orders with different distributors, since all the notes come due three to five months later. At the beginning of March, Terpstra also was seeing more service activity. "That has picked up a little bit," Terpstra says. "We also have a pretty good winterization program and storage. That carries you through for a little while, but that money runs out around December or January." The loss of cash flow caused Terpstra to pull out of the two or three regional boat shows he usually attends. "The cost of getting into the shows, I hate to spend it," Terpstra says. "But on the flip side, you need to get your name out there and your product out there. I think people are still going to boat shows, but most have been down in attendance." To compensate, Terpstra will pay for ads on new electronic billboards that will flash his business up for 15 seconds before flipping to another advertiser. And as always, he&apos;ll send flyers reminding everyone to tune their engines and advertise the great deals in his showroom. Those dealers who did participate in the shows seemed to emerge with a good feeling. Beauregard was pleasantly surprised by the Detroit Boat Show. Sales were comparable to 2008, he says, and Colony gathered strong leads. "Ironically, probably 80 percent of the boats we sold were to customers new to us," Beauregard says. "They were either new to boating or new to Colony and our product line, which is a good sign, because we&apos;ve already done a pretty good job keeping our arms around our existing customer base. So to see new faces was refreshing." It helped that several of his major competitors were not at the show, Beauregard says. The decision not to downsize the display also worked in Colony&apos;s favor, and even though attendance was slightly off, there were still 70,000 people looking at boats. "In this region compared to the last couple years, there seems to be less negative feeling and more of an optimistic feeling that perhaps the worst is behind us," Beauregard said. Attendance at the Detroit Boat Show, which ran Feb. 14 through Feb. 22, was down, partially due to snow on the closing Saturday, Snider says. "I felt there was a more positive attitude about the future by many attendees, and sales, for the most part, exceeded expectations," Snider says. "Some of our dealers, who not only exhibit at our show but also in Cleveland, felt that consumer attitudes were more positive here than at the Cleveland show." Larsen, the dealer from Waukegan, Ill., says the Chicago Boat Show was also positive with higher attendance on the weekends and only an overall decline of 3 percent. "We sold a couple, and we have a fair amount of interested parties," Larsen says. "Again, the challenge has been their comfort level with that kind of investment." And regardless of the hurdles still to be overcome, the Rust Belt has all the best ingredients for boating success when the recovery arrives, Schultz says. With the richest fresh water supply in the country, hundreds of smaller inland lakes and thousands of miles of navigable rivers, resources are abundant, Schultz said. Despite the population loss, there is still a large population base. And, despite the loss of jobs, a lot of money remains in the region. That makes the future outlook for boating look good, even if the region isn&apos;t the first to emerge from the recession, Schultz says. If GM or Chrysler go bankrupt, it might take longer for this area to rebound Snider says. "If this happens, my guess is they will use the opportunity to renegotiate many of their union contracts to the level they need to stay competitive to the disadvantage of union personnel," Snider said "If bankruptcy does not happen, we may have bottomed out but if it does, it could be more challenging. Either way, I don&apos;t think we will see much improvement, if any, until 2010." Still, Snider hopes the billions of dollars pumped into the economy will help the nation, particularly those areas that went into the recession first. "There is no doubt, there is pent-up demand, and I think citizens who have job security and want to have a quality boating experience with their family will say enough is enough and not put their lives on hold," Snider says. "We have a hearty group of dedicated boaters, sailors and fisherman here, and all we need is some good signs that the economy is turning around to change attitudes. Stronger consumer confidence is critical." That is a sentiment echoed by dealers around the Great Lakes. "Definitely there&apos;s a lot of pent-up demand here," says Larsen. "There are a lot of people who haven&apos;t purchased, but they&apos;ve wanted to. We all feel that way."